One of the most frequently asked questions we get concerns the use of wireless vs. cellular monitoring. Understanding the difference between the two is very important because it makes a huge difference as to the security of your home alarm system. Wireless is a method of communication between a sensor and the control panel, and/or between the control panel and the security company’s remote monitoring station. Cellular is the name for one certain type of wireless communication network or path that allows a dedicated communication line exclusively for security system purposes. The ideal system has a wireless communication connection between both the sensors in your house and your control panel, as well as your control panel and the monitoring station. 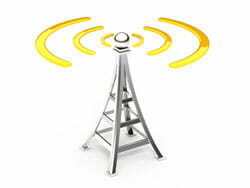 Many providers that offer wireless provide only the former. The problem? If your sensors and panel are communicating over your wireless connection, all a burglar needs to do is disable your internet capabilities, and they will have disabled your alarm system. It goes without saying that a system that also relies on a non-wireless connection to the monitoring station (i.e., the control panel does not contain a cellular device) is even more subject to failure. We refer to companies with a full cellular setup as 100% cellular (this is your best possible option). To find a home security system with cellular monitoring, visit our best home security system article.